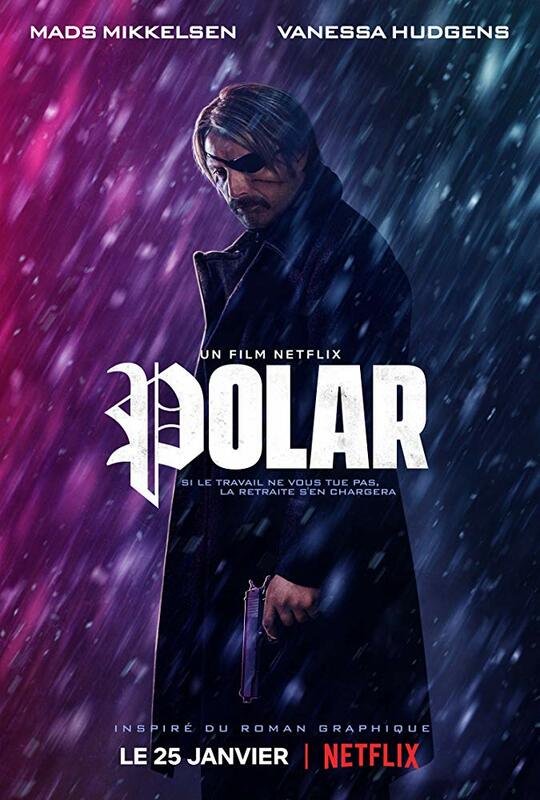 POLAR is the latest Netflix Original based on the Dark Horse comic, “Polar: Came From The Cold” by Victor Santos. 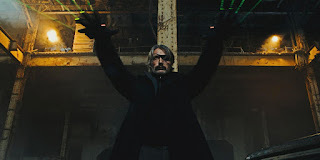 Duncan Vizia (Mikkelsen), an aging assassin is preparing for retirement when his employer, Blut (Lucas) begins a new policy to kill off all retiring killers to save on pension overhead. He goes into hiding in a small town where he meets Camille (Hudgens). His former coworkers track him down, kidnap Camille and otherwise generally piss him off. Hilarity ensues… but not really. I’ll start off by saying that I have no familiarity with this film’s source material. I don’t read a lot of comics/graphic novels and this one in particular would have never even been on my radar. I’m saying this in order to clarify that my comparison between the motion picture and the material it was adapted from is speculative in that respect. In short, all of the disparaging things I’m about to say about the film, should in no way be misconstrued as criticisms of what I can only imagine is a very successful comic. But before I get to that, let’s pick out what I liked about the film. This won’t take long. I was actually struck by how well the costumes and set dressings mimic and inform the contrasting themes of our two sets of characters. Our two main characters, Duncan and Camille are in hiding out in a snow filled rural area of Montana. Everything about their lives seems to be muted in unending Earth-tones to support this. Their clothes match the trees and the wildlife and their unpainted log cabins add to the notion that these are two people that found the perfect place to blend in. In contrast, their pursuers are shown as a loud and boisterous group of assassins traveling around the country on a blood-splattered murder spree. When the two worlds first collide, it is clear that Duncan enjoys the home court advantage. Later, when he is forced out of his comfort zone, the hue of the underworld immediately begins to come down to his level, symbolizing his unyielding power. It was shot by Pär M. Ekberg, a frequent collaborator of director, Åkerlund. They have worked on a lot of music videos prior to this; most notably, they did one of the segments of “Beyonce: Lemonade”. Their history of work in this medium shows. looks really badass to other thirteen-year-olds. But the rest of us are left to wonder: “Who’s in charge here?” This is the unfortunate trap that a lot of live action films fall into when they are based on comics. The same things that come across as “edgy” on the panels of this medium translate very differently when adapted to the screen. This applies to the editing style specifically. 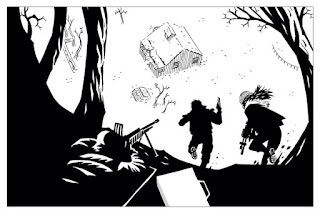 An action sequence in the comic will find it necessary for multiple angles bouncing back and forth between perspectives in order to inform the audience properly. The most literal translation of this to a motion picture is the quick motif of jump cuts. This is both unnecessary and visually assaultive. It serves to disorient rather than inform and it’s one of my pet peeves. Interestingly though, this technique is usually utilized to mask the fact that the stunts and the action set pieces were not very well choreographed. This doesn’t appear to be the case here. It just seems to be a stylistic choice that I don’t particularly appreciate. The other way in which these types of “adaptations” always rub me the wrong way is in the dialogue. It is much more acceptable to have this brand of corniness read in a speech bubble hovering over the head of a heightened cartoon character. But when actual people read these lines, it’s clunky and distracting. I am constantly taken out of the story. But alas, being taken out of the story of this film may not have been the worst thing conceivable. There are some very obvious plot holes here. Many of which stem from the organization’s financial plan. It just doesn’t make much sense to me. And even if it did, I’m pretty sure that by the forty-minute mark of the film, Duncan has killed enough of his coworkers to have sufficiently made up for his own pension plan. Then later, a couple of Deus Ex Machina type characters are introduced to move the story forward. One of which is played by Richard Dreyfuss. He plays a previously retired assassin who apparently was grandfathered in to the company’s older “don’t murder retirees” policy?... I guess. Plot holes are the first thing to be forgiven in an otherwise good movie. This is sadly not the case here. To be clear, my thirteen-year-old self would have loved this movie.